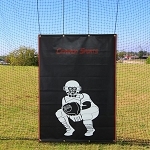 Batting Cage Nets • Discount Prices • Free Shipping! Some people already have a batting cage or prefer to set up their own custom batting cage frame. If you are one of those people, you just need a batting cage net - not all of the extra hardware. 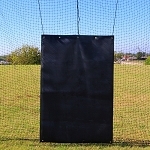 Save money and purchase just a batting cage net here. 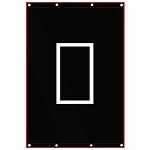 We have several sizes and net strengths to accommodate most situations. If you do not see the size/strength you need, please give us a call, toll-free, at 1-800-651-7130 and we'll provide a custom quote for you. After looking at the various net sizes and strengths, be sure to scroll to the bottom of this page for questions we are frequently asked about these nets. What do the different net strength numbers mean? #24 - Residential, non-commercial net strength. Typically these are fine for light, home use through high school age and will last for many years if they are not exposed to prolonged severe elements. #36 - Light commercial net strength. These are generally used by high school teams or individual college players. They hold up to the elements a little better than #24 nets. #42 - Commercial grade net strength. This is the strength net that most college and pro baseball teams have in their cages. They are even more resistant to the weather and to extremely hard hit balls by many players. Can I leave my batting cage net up, year round? You CAN do that, but don't expect your net to last very long - especially if you live in a climate where snow and ice are prevalent in the winter time. Even exposing a net to rain will degrade its strength. Water is one of the most destructive forces on the planet (just ask the Grand Canyon). Therefore, it is always a good idea to remove a net before storms. If you must leave your net up during inclement weather, it is best to purchase the highest strength netting that you can afford - #42 netting is the best.